Preheat oven to 425°F. Line large baking sheet with foil or spray with nonstick cooking spray. 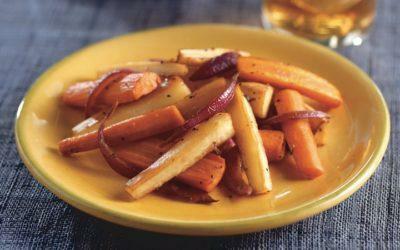 Combine carrots, parsnips, onion, vinegar, oil, salt, and pepper in large bowl; toss to coat. Spread in single layer on prepared baking sheet. Roast 25 minutes or until vegetables are tender, stirring occasionally. Note: Parsnips are a pale white root vegetable similar to the carrot in shape. The parsnip, however, is broader at the top and has a smoother skin. The longer it stays in the ground, the sweeter it becomes. Choose parsnips that are firm, unblemished, and small or medium in size (about 8 inches long). Rinse and scrub parsnips with a vegetable brush to remove embedded soil. Peel parsnips with a swivel-bladed vegetable peeler or paring knife. Trim off ends and discard. For even cooking, parsnips are best chopped, cubed, sliced, or cut into strips before cooking. Serving size: about 3/4 cup per serving.